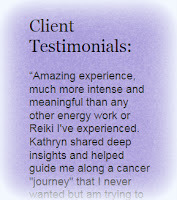 I'm so grateful when clients are moved to share their experience of Reiki. It makes such a difference for others considering a Reiki treatment. Could you benefit from some Reiki healing energy? Get in touch! It's that time of year when a lot of folks are out and about shopping for gifts for their loves ones. I second Carol Makosky's vote to shop local. As she says, everyone gets their hair cut, eats meals, etc. Local artisans' crafts, car detailing, house cleaning, concert tickets, massages are all win-win-win gifts. At each turn, we can choose to support our local small businesses, artists and musicians, or some factories overseas. Perhaps your friend or family member might enjoy a Reiki session? I have Gift Certificates available for hands-on as well as distance treatments, so it doesn't even matter where in the world they are! Have a look at the Client Testimonials (left column) if you want to see who and how they might benefit. Wishing you and yours a blessed and happy holiday season. I have stopped making donations to cancer research. The truth of the matter is that cancer has been cured many times over, but such discoveries are promptly suppressed, one way or another. Chemotherapy is the go-to allopathic treatment for cancer, but it is no cure. My understanding is that it wreaks havoc on--all but destroys--the immune ‘system’. The trouble with this, I understand, is that cancer arises when immunity is compromised to begin with. Beating it down to all but nil seems to be the last thing you’d want to do. I remember a brief conversation I had with a cancer researcher (scientist) at a party several years ago. I asked her if, in their search for a cure, they were looking at metaphysical aspects, given these make each case (cause) so individual. For my part, I couldn’t see how their work could succeed without considering that. It was an innocent remark, not intended to offend. She gave me an odd look, a mix of incredulous, angry, and guilty, then walked away. That's when I first got that my views and understandings are unpopular in the mainstream community. In recent years, I have done a good deal of research into (among other things) causes and adjunct if not alternative treatments for cancer. I decided to compile my findings into a list, which I will add to and subtract from over time, as prompted. Write me if you would like a free copy of this list. Note: I cannot and do not personally vouch for all of its content: use your own discretion! All I can say is that it all resonates with me based on what I see and understand from years of energy practice, professionally and otherwise. It is a journey. For best results while making the journey, take a holistic approach. Look at your consumption (via mouth, eyes, and ears), exercise (or lack thereof), environmental factors (including % of time spent in Nature), nutrition, sleep, emotional factors (e.g., do you stuff stuff? ), job satisfaction, stress level, fear/worry level, where you place your focus in life, what you think about (thoughts are things, and we create with them). Don’t “fight” or “battle” cancer; instead, listen. Get the message, the gift, because there is one. Your body is talking to you. To quote from above, cancer is not trying to kill you, it’s trying to save you. Replace fear and/or resistance with Love. Western Medicine so often treats symptoms (effects) vs. causes, when an illness or disease is an effect, a result. This has obvious limitations. Better to identify the cause(s), and to address the cause(s) not the effects. Consider your "result" as you read or view this material. Can you trace it back to causes? If so, you can then better intuit* which if any of these treatments might be best for you. At the least, let this material trigger your own inquiry and exploration, to suss out--bushwhack, if necessary--the path of healing that is right for you. One last note. Keep in mind that one can be healed without being cured, just as one can be cured without being healed. *If your intuition is weak, seek out a dowser or similar practitioner like myself to listen for you. It may be incredible for some to think that Reiki can travel long distances and still be as powerful and effective as it is hands on. Not so for practitioner and recipient, however. One need only experience distance Reiki to know this first hand. A client's belief that Reiki works beyond space and time is not even required for its efficacy. And though I need no proof, it's always lovely to hear and see corroboration from clients--as I did most recently from Helen, who scheduled distance Reiki in advance of her cataract surgery. She knew that without it, she'd be a nervous wreck both the day(s) prior and right up to the moment of surgery, as that was her history without exception. She wanted instead to be "to be calm and peaceful and that the surgery be successful." I was very aware that the Reiki would be delivered at the "appropriate time" as that's what you had said--so I was very supported and confident that I was being treated at the appropriate time--everything went excellently… Thanks so much kathryn...amazingly I had absolutely NO ANXIETY the day before or on the day of surgery that I was aware of and that for me who has severe "white coat syndrome" was amazing--as I said everything went perfectly and so I am very grateful... I couldn't believe that right up to wheeling me into the OR I had no anxiety...the day before i did have a tremendous surge of energy..8 hours of house cleaning ..ha ha ha..and great focus preparing to be away from home for 2 days... Reiki is a wonderful thing. I have had the privilege to treat in this way those I've known and those I've never met, both near and far: as near as my own living room, when my cat was ill and wouldn't tolerate hands-on Reiki, and as far as France and Denmark, for example. Truly, there are no limits in time or space, with energy healing modalities such as Reiki. The "past" can be treated, the "future" can be treated: people, animals, situations, relationships--in this lifetime and beyond, wherever there is a need for healing. I couldn't agree more: Reiki is a wonderful thing. In my part of the world, it is the season of rebirth. The earth is coming back to life, sprouting green and yellow and so many pinks: the Spring Parade has begun! There is the impulse to refresh our homes and gardens as well. What better time then to apply--or augment--what you know about energy clearing. This will be the scaffold topic of my radio interview this Saturday, April 26 when I will once again be the featured guest of Victor Robert Venckus on Expanding Awareness from 10 - 11:00 a.m. EDT. You can tune in to 90.3 FM or online to listen. I will be sharing from my experience of working with energy both in and outside of my Reiki practice, and I expect to talk about completing past life patterns, energetic clearing (self, food, water, objects, environments) and more, including methods for immediate benefit and use. I hope you will join us--and maybe even call in with your comments or questions when Victor opens the phone lines in the latter half of the program. After Saturday, the show will be available here. Hit a bi-i-i-g pothole while driving and what happens? There goes your wheel alignment! It doesn't matter whether you had that alignment yesterday or a year ago: if it's messed up it's messed up, and you are going to need another. Reiki is like that wheel alignment, it occurs to me. It works. It does the job, balancing, clearing, healing. But what happens after a treatment, after the client leaves the table? A surgeon can cut out a lung cancer, but what if the patient continues to chain smoke after surgery? The patient or client must act to support their wellness if they wish to maintain it. Persist in doing what supports your imbalance, disease, or illness however and you will experience more imbalance, disease, illness. Collaboration is the operative word! You have the power to be well, right now. And Reiki is there--here--to assist as needed. Today's New Moon energies can be like wind at our backs if we make use of them. What has your heart and soul been longing for? Dare to dream it. Now. Kathryn, I have been reading the notes, I find them very useful and really appreciate your taking the time to write them down. They are such a useful guide… Thank you again for your amazing Reiki healing, I feel great- a feeling of lightness and hope. You are truly gifted! ~Stephanie H.
My perceptions have been completely transformed through working with you. I was skeptical of Reiki at first - always giggling when I heard people mention it. After my experiences at Boston Reiki Healing, I see and feel such an energetic shift and am continually amazed and humbled at the at the intelligence of Reiki. --Linda O. The experience of long distance Reiki with Kathryn was amazing and extremely helpful. I became fully aware of a direction I needed to take to help clear chronic pain. I have followed what I learned from the sessions with good results (fingers crossed). Thank you Kathryn! Thank you so much Kathryn--to give you some follow up on my Reiki session-I have felt MARVELOUS since then-it seems you have put my energies back together creating a sense of relaxation and well being that I haven’t felt for a long time. I think you are a true healer--God Bless You---love and peace---Helen K.
M - F, 10 a.m. - 6 p.m.
© 2010-2013 by Kathryn Deputat. All rights reserved. Watermark theme. Powered by Blogger.